A important new book has just been published on the technology and policy of elections. 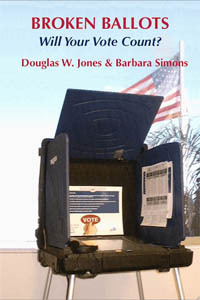 Broken Ballots: Will Your Vote Count by Douglas W. Jones and Barbara Simons, covers voting systems from the 19th century to the present, with particular focus on the last two decades. The authors describe the strengths and weaknesses of the machinery itself–lever machines, optical-scan vote counters, touchscreen voting computers–with technical sophistication, yet in a way that will be accessible to a wide audience. Then they describe the strengths and weaknesses of the policy processes–at the level of election administration, congressional legislation, and Federal administrative-branch agencies–with particular emphasis on the last 10 years. The authors are experts in the field of voting technology and policy, and it shows. The book is well researched with extensive citations, but it’s also a good read (with photos and illustrations) that has an interesting story to tell. Did they cover the NJ case in which you testified? At most it is mentioned in passing. But there has been a lot more than just the NJ case that’s important in electronic voting (technology and policy) in the past decade or more. Are there any solutions going forward to have reforms nationally? Does each county in every state need to file a grand jury complaint?